Meretz chairman Zehava Galon refuses to participate with Zionist Union, Yesh Atid after latter two skip critical vote. 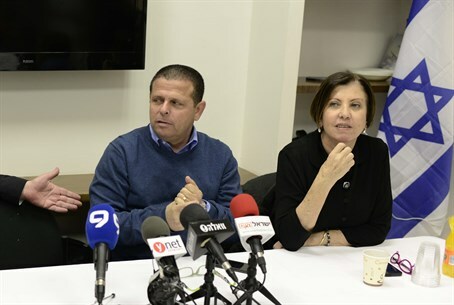 Meretz Chairman MK Zehava Gal-On has turned against the Zionist Union (Labor-Hatnua) on Wednesday, after the latter did not join Meretz in voting on the Citizenship and Entry into Israel Law's renewal. The Citizenship and Entry into Israel Law is a temporary provision that was approved by the Knesset in July 2003 and renewed every year since then. It disallows residents of Arab countries, Gaza, and the Palestinian Authority (PA) to claim Israeli citizenship via marriage or on grounds of family reunification (i.e. by claiming relatives within 1949 Armistice lines). In specific cases, applicants can apply for permanent residency, but are not necessarily given the blue Israeli teudat zehut, or ID card. The far-left Meretz party has consistently opposed the law, which is meant to protect Israel's Jewish majority from attempts to impose an Arab majority via the backdoor. Many Opposition MKs were conspicuously absent from this year's vote to extend the law, prompting Galon to declare Meretz's refusal to cooperate with the Zionist Union in future votes. "The hottest places in hell are reserved for those who, in times of great moral crisis, maintain their neutrality," Galon said, quoting epic 14th-century poet Dante Alighieri. She then accused Prime Minister Binyamin Netanyahu of "collecting the incitement of his party members" to use against Arab MKs, claiming that it is an extension of Likud's campaign to toughen security on buses leaving and entering Judea and Samaria - which she views as discriminatory. The livid Meretz chairman then blamed the "servile nature" of the Zionist Union and Yesh Atid - Meretz's natural partners on the Left - in remaining absent from the vote. "With such an Opposition, Netanyahu can be relaxed that his reign will be fortified for years to come," she fired. Galon's outburst evoked a highly critical response from Zionist Union MK Eitan Cabel who responded by saying that he is not "being graded" by anyone from the Opposition or the coalition. "Zehava Galon's shaming campaign is out of line," Cabel said. "We did not participate in the vote and that's legitimate." "We cooperate with Meretz as part of the Opposition, and on some things we agree and on some we do not," he continued. "I will not allow someone to shame me for every vote I do not attend, it won't happen." "We are fighting for this as the Opposition and we should not apologize for everything on every issue," he added.